In 30 years, 78% of Israel’s primary school students will be haredi or Arabs, and only 14% will be in the non-religious State school system – if the trends of the past decade continue. 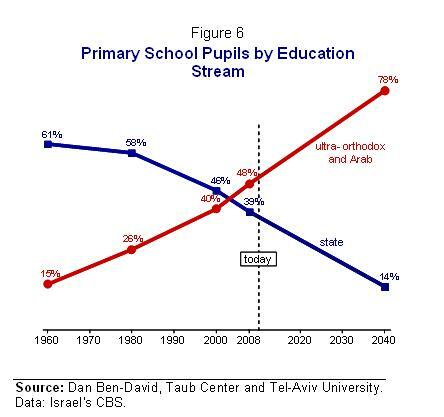 In 1960, 15 percent of all primary school pupils were enrolled in either the haredi (ultra-Orthodox) or in the Israeli Arab school systems, while 61 percent were in the non-religious State school system (Figure 6). Two decades later, by 1980, the share of ultra-Orthodox and Israeli Arab pupils rose to 26 percent. Those children are today’s working age adults, whose rates of non-employment are described above. According to Nachum Blass from the Taub Center, during the first decade of the 2000s there was a decline of three percent in the number of pupils in the State school system, an eight percent increase in the State-Religious school system, a rise of 33 percent in the Israeli Arab school system, and 51 percent more pupils in the ultra-Orthodox school system. As a result of changes over the past few decades, nearly half (48 percent) of primary school pupils in 2008 were ultra-Orthodox or Israeli Arabs. If the changes of the past decade continue, then in 30 years, in 2040, the share of ultra-Orthodox and Israeli Arab pupils will be 78 percent of all pupils in Israel’s primary schools, whereas the share of pupils in the State school system will fall to only 14 percent. There are two main reasons why it is reasonable to assume that this situation will not materialize. If, as adults, these children will adopt their parent’s current employment behavior, it will be difficult for the State of Israel to survive. Conversely, if as adults, they adopt employment rates close to Western norms, it is likely that future birth rates will also be different than today’s. In order for tomorrow’s adults to be employed 30 years from now, then today’s pupils need to receive an education befitting the needs of a modern economy. This is not the situation today in Israel. The country’s level of education in the core curriculum subjects is the lowest among advanced Western countries – and among haredi and Israeli Arab pupils, it is even lower.